It’s autumn, and apple season. It is a time for the smells of cinnamon to waft through the house. To go to apple orchards, to have apples in the weekly vegetable box delivery, and to look for ways to cook with apples. I think this is my first ever Sunday blog post. I love Sundays and usually spend them offline and mostly in my kitchen – cooking is how I relax and I like to think of my speciality as “comfort food”. On our menu this evening is roast pork with roasted potatoes, buttered cabbage and red carrots, and yes – homemad applesauce. Pork would not be complete without applesauce! But apples are so much more than applesauce. 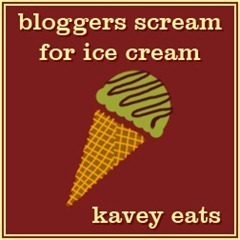 Recently I came up with a take on apple pie for the Kavey Eats Bloggers Scream for Ice Cream Challenge series. I am late in getting my post up (September – where did you go?!) but I still need to share this beauty with you. Kavey’s September theme was spice. I was a bit stumped but then thought of cinnamon. And of course thoughts of cinnamon led me down the rabbit hole to apple pie. Nothing – well very few things – beat the deliciousness of homemade apple pie with vanilla ice cream. So why not combine the two? I made a batch of vanilla ice cream, reserving half of the vanilla ice cream custard to blend with apple pie filling which I had made, and then adding all of the ice cream custard to my ice cream machine. The result was pretty good – although I think I probably would have added a dusting more of cinnamon, for an extra punch. – Heat the milk, cream, 1/2 cup of sugar, and scraped vanilla beans (from the pod) and vanilla pods over a low heat until sugar dissolves. – Add egg mixture to cream to make a custard. I am pretty comfortable with this step, but if you aren’t the keys are low heat, constant stirring, and time and patience. You do not want to scramble the eggs, merely disperse them and through the heat thicken the cream sauce into a light custard (so that it is thick on the back of a spoon). Do not rush this step or you will wind up with scramble and will have to start again. – Once finished, transfer half of the ice cream custard to your ice cream machine, the other half to a food processor or blender. Add the blended apple pie mix to the half of the ice cream custard reserved in your ice cream maker. Churn. This ice cream is fun to serve with shortbread cookies, for a crust like sensation, or maybe with the cookies crumbled and stirred through the ice cream. We served it with cookies on the side. And it was a hit – vanishing before I could get the perfect photo, all I was left with was one spoonful to photograph! If apple pie ice cream is not your thing, other ideas for apples include a delicious apple spice cake (posted here in October 2010) and of course, apple pie (posted on #52bakes in January 2012). However you choose to spend your Sunday – enjoy it!